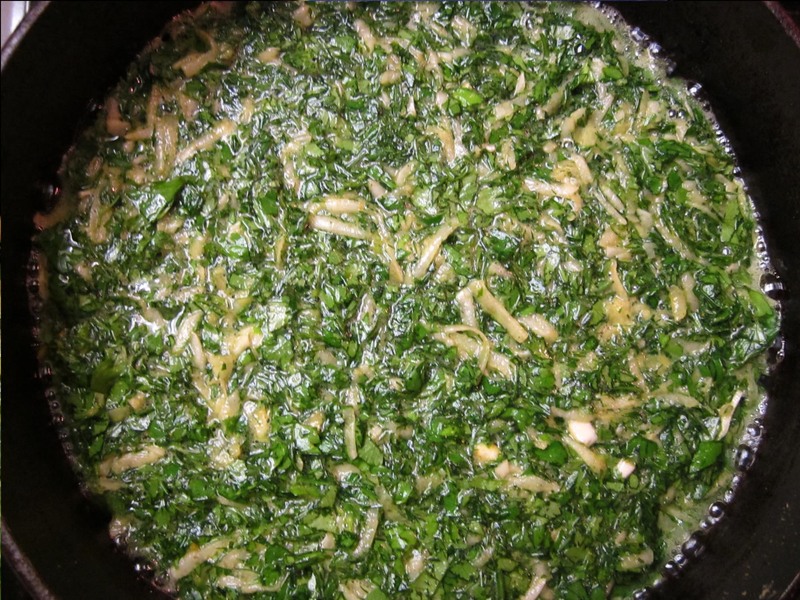 If you have ever tried Persian food, you may agree that it is filled with unique and unexpected flavor combinations. Upon trying their food for the first time, you may be surprised by the clever ways they blend fabulous flavors, but then again, you may not be so amazed. After all, modern cooking is becoming increasingly brilliant, with the way ingredients and flavors are brought together to create unique new dishes. Often times, fresh, healthy ingredients are being incorporated in imaginative ways as well. One could argue that Persian cuisine is ahead of its time. This dish is a perfect example of their use of fresh, healthy foods combined with colorful flavors. 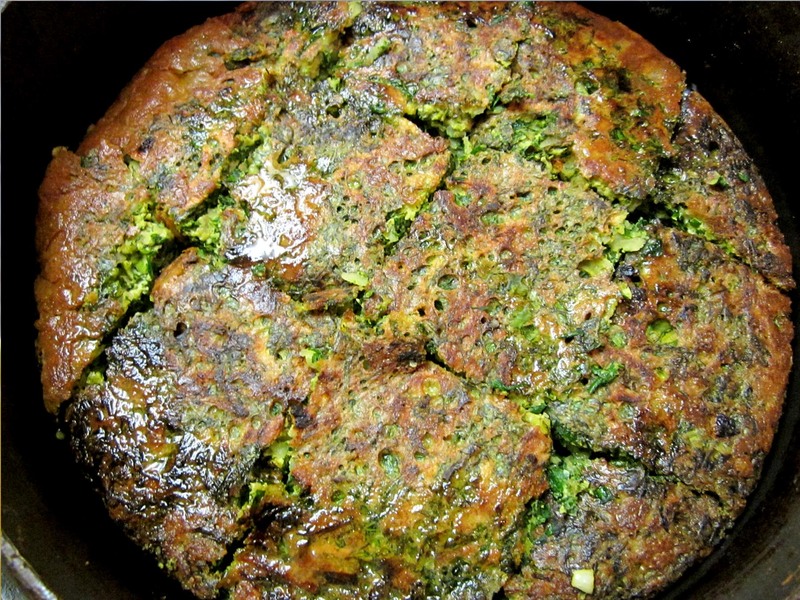 Best described as a frittata, the star ingredients of this dish are fresh herbs. 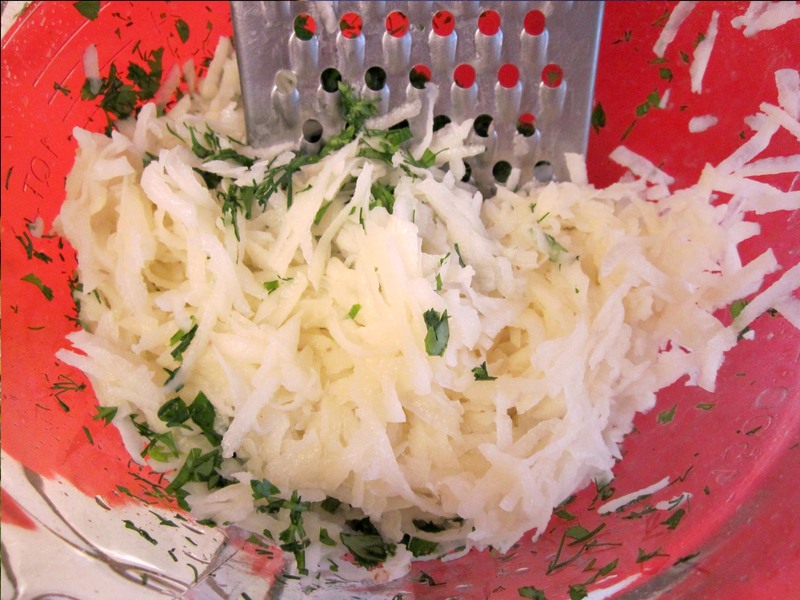 This version uses dill, cilantro and parsley, as well as shredded potatoes, eggs, and a little garlic and seasoning. 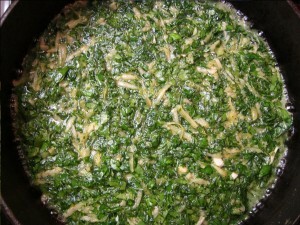 It can be served hot, but is more popular served cold, and is a frequent picnic food. I like to eat mine with sliced tomatoes and sometimes pita or tortilla bread. In the comments section, share how you will serve yours. Serve hot, or allow to cool and chill. 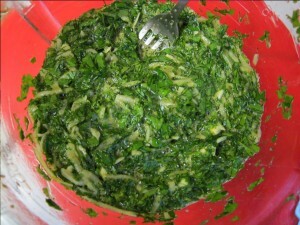 A popular Persian dish, commonly served at picnics. 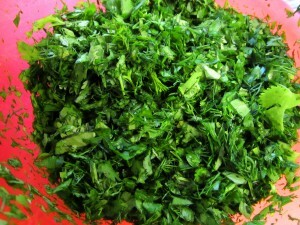 Fresh dill, parsley and cilantro mixed with shredded potato, eggs and seasonings. Wash herbs thoroughly (I use a salad spinner to dry mine). 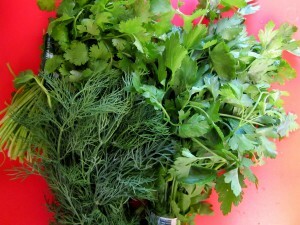 Remove large stems from herbs and chop the leaves well. (You could use a food processor, but I don't like they way the herbs turn juicy and mushy). 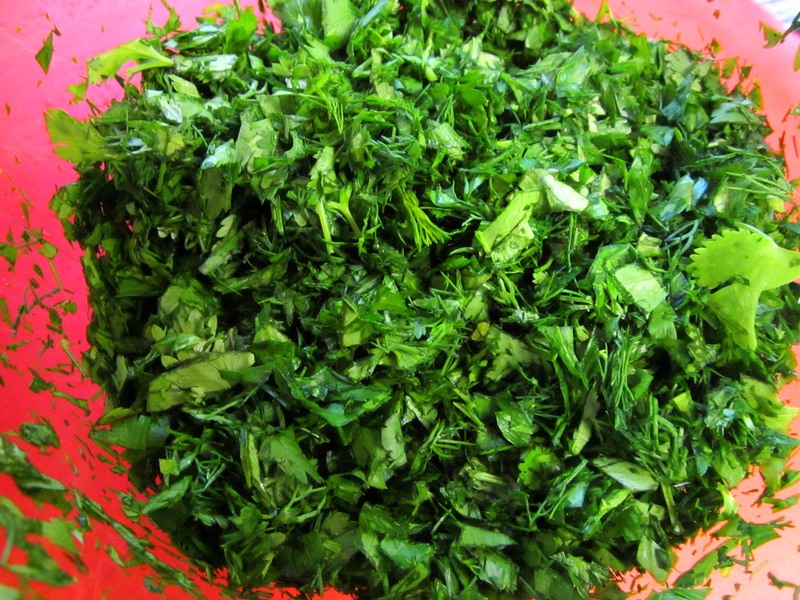 Toss chopped herbs in a large mixing bowl. 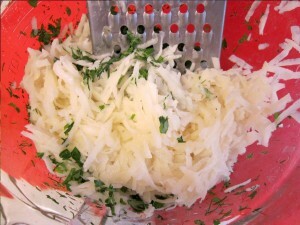 To the herbs, add peeled, shredded potato. Add chopped garlic, eggs, turmeric, cinnamon, salt and pepper. Mix well to combine. Will be the consistency of cake batter. Heat a large shallow fry pan (mine is 9" in diameter) over med-high heat. 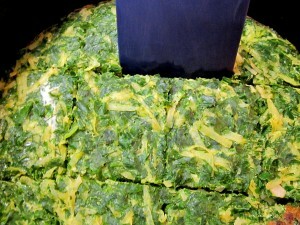 Add 1 tablespoon oil, pour in the frittata mixture, turn heat down to medium and cover with a lid. Let cook, covered for about 10 minutes. That side is done when the bottom turns a dark brown color. 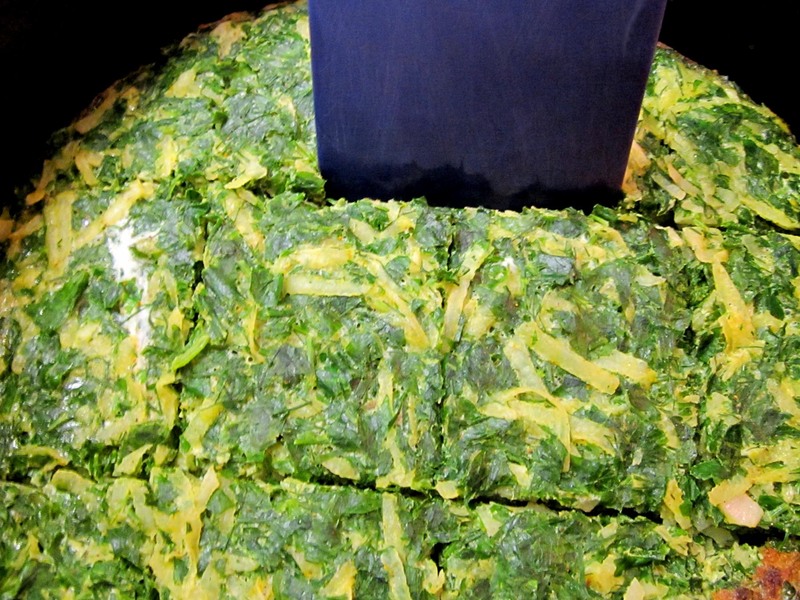 With a scratch-proof tool, such as a spatula, cut frittata into about 10 squares (or you can slice them in 6-8 triangles, like a pie). Flip each piece over. Drizzle 1-2 more tablespoons directly over frittata, cover once more and cook for another 10 minutes over a medium-low heat. Remove and serve hot. 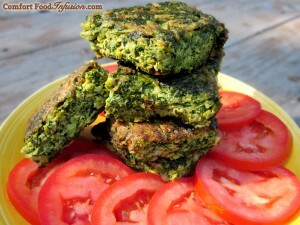 Or allow to cool, place in refrigerator and then serve cold, with sliced tomatoes and pita bread.